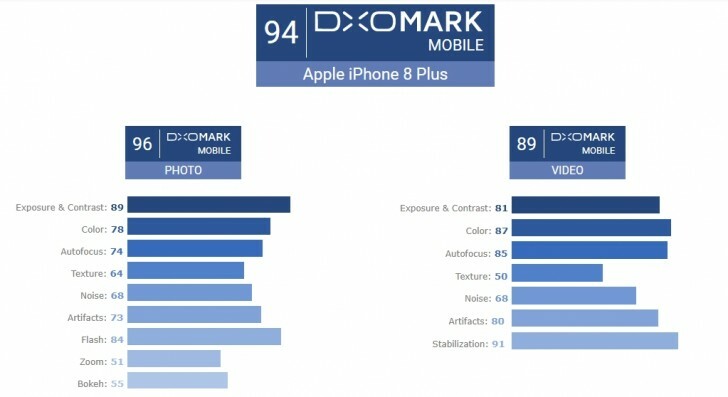 With sales of the iPhone 8 and iPhone 8 Plus starting today, DxOMark has published comprehensive reviews of both handsets' cameras. Lo and behold, they have jumped straight to the first two spots in the DxOMark rankings, leaving the HTC U11 and Google Pixel in the dust. The Pixel used to be the king of DxO until the U11 got the same score of 90. Now though, the iPhone 8 Plus' camera becomes the best that the lab has ever tested, with a score of 94. The iPhone 8's shooter isn't far behind, ranked No.2 with its 92 points. The iPhone 8 Plus shines in picture taking, with a record-breaking Photo score of 96, while for recording videos it gets a score of 89 - tied with the HTC U11 and slightly below the Pixel's 91. The iPhone 8 Plus has "outstanding image quality" and "an industry-leading Portrait mode". It is at the top of the charts in nearly every category, while its advanced software means it does "an amazing job" at capturing HDR scenes and images with faces in them. It has the best zoom and best bokeh effects in a mobile device, very good video stabilization and color rendering, as well as good face tracking in bright light. On the flip side, there's some color cast in low and indoor lighting for photos, as well as some autofocus issues. For videos, exposure issues are present, and noise is visible in low-light. The full breakdown of scores by category can be seen in the image above. Moving on to the iPhone 8, this becomes the highest-performing single-camera smartphone tested by DxO Labs. That's not surprising of course, seeing as how its rear camera is identical to the main camera of the iPhone 8 Plus. The bigger device's secondary shooter gives it the edge when it comes to zoom and bokeh, which is why it scored higher than its smaller sibling. As you'd expect then, the pros and cons outlined above for the iPhone 8 Plus' dual rear cameras mostly hold true for the iPhone 8's single snapper. You get among the best HDR performances of any device with the iPhone 8, very accurate autofocus, but some autofocus delays in both bright and low light. Make sure to hit the Source links below for the full writeups produced by DxO Labs for both devices if you're into the nitty gritty. And stay tuned for our own camera tests for Apple's newest smartphones.